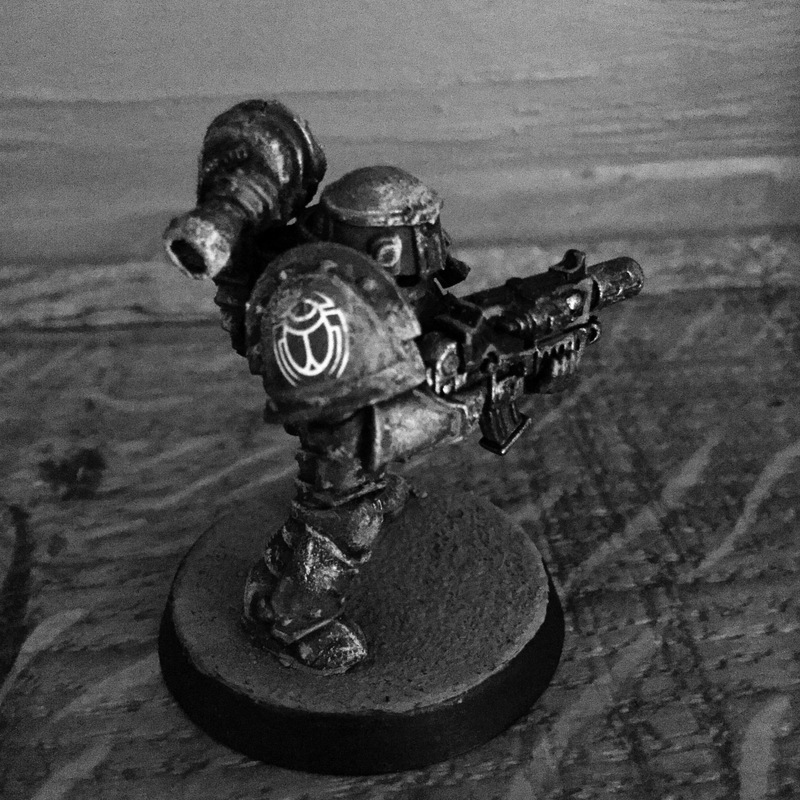 I mentioned in day three on my tribute model on the sons of Horus how I was inspired by the Horus Heresy books. I took inspiration from various books relating to the Sons of Horus including Horus Rising, Vengeful Spirit and various short stories in the series. Recently I read Graham McNeil’s first book in the series, False Gods, a continuation from Horus Rising following the aftermath of the genocide of Interex. The story really caught my attention with lots of questions about the Emperor and his “Great Crusade”, religion and how things could have gone if Horus acted differently to the events that take place. Having read Erebus in other books (a majority of books I own has Erebus in it, and most are Word Bearers story! ), I was intrigued to learn how he enacted the downfall of Horus with the help of the Serpent Lodge. I was almost glad when Akshub killed him, it was good to finally see the old wretch get what he deserves after all the terrible things he’s done. But alas, the First Chaplin survives and the rest is history. What interested me was how Graham McNeil interwove religious and historical myths on snakes, and how they are portrayed by human cultures. What would be said by Kyrle Sinderman about what the serpent represents would be shocking when everything starts to align, even the revelation has not yet really dawned on Loken, the protagonist of the story, just how dire Horus’s resurrection would spell for the galaxy. There’s an interesting part of the story where the Sons of Horus meet a human world that is to be in compliance, with peaceful arrangement to discuss relations. What’s fascinating is that the Brotherhood, the armed forces of the planet, share nearly the same power armour design as the Sons of Horus. This is strange as the civilisation of this world hasn’t made contact with outside communication for many decades. Now the military do pale in contrast to the Astartes due to being biologically enhanced, but nevertheless appear very much like their brethren. The mystery as to why they look the same is unclear, but their wealth of STC templates were very promising to the 63rd expedition and Horus’s own Mechanicum expert, Regulus. Shame any good will was established since Horus thought putting a bullet to the Brotherhoods ambassador was a good idea! Overall, I thoroughly enjoyed this novel with an engaging story that really asks a lot of questions, and very few answers. I’ve got a lot of inspirational ideas from reading this book, including my own tribute to the Sons of Horus with my display model (you can find that on day three in this years 12 days of Winter!). Im currently stuck between making a tribute piece on Legio Mortis using AT Titan miniatures or Primaris sized tribute models of the Mornival. Either way, I’m getting back into painting something new thanks to this inspiring book. The Horus Heresy book series has been a long line of stories that really expands the universe of Warhammer 30k, not all of the stories are perfect, but on the whole it’s great Sci-Fi historical journey! 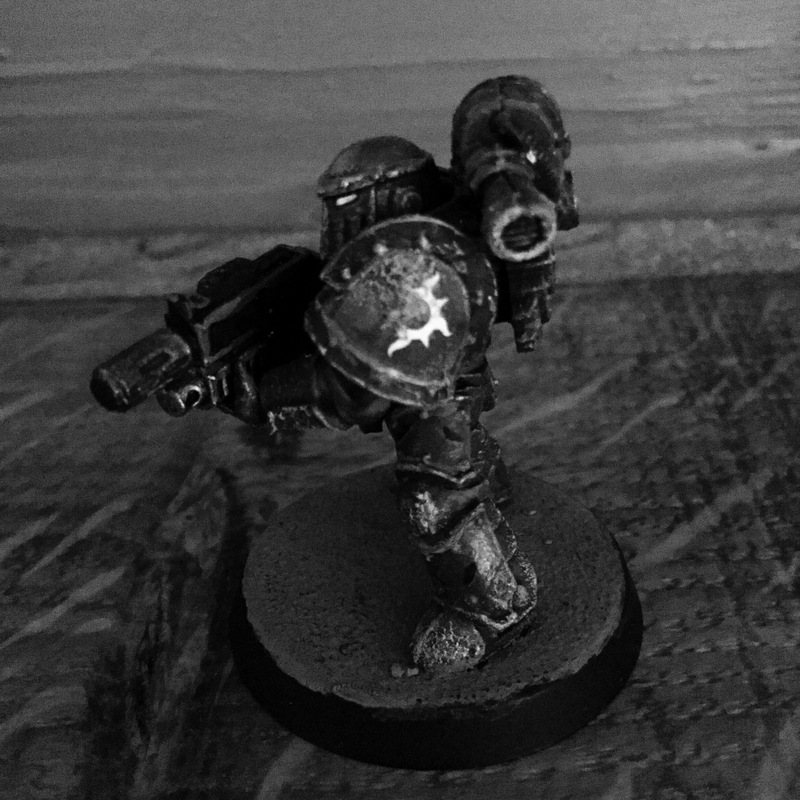 Today, I’ll be presenting part two of my painting work on 1st Captain Sevatar of the Night Lords Legion, this time focusing on his diorama base. I’ve had to delay this post due to distractions of late, so I needed this post done before I go on to my new army project. For my first every resin kit I thought it went really well, and I was glad to have been able to paint a pretty decent model. The diorama represents Sevatar as he fights against the Dark Angels, slaying one marine below him. I can’t remember what the engagement was in HH (Tharamas Crusade? 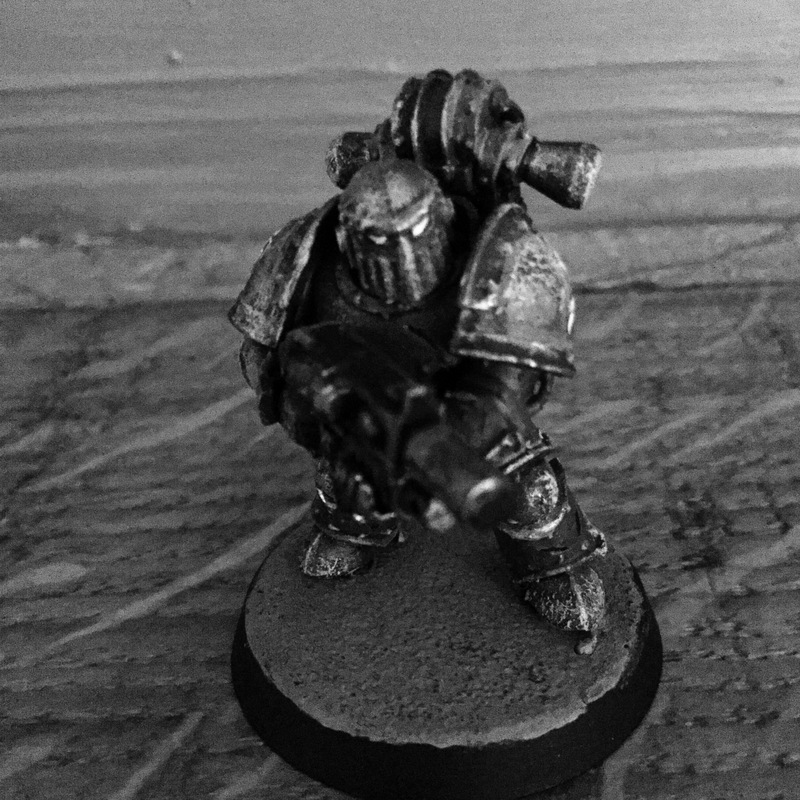 ), but I thought it would be awesome to paint 30k Dark Angels as a little experiment. Now that Sevatar is complete (over month now), I’m keen to add one or two more HH character series models for my display case. It’ll be either Conrad Curze, Perturabo, Lorgar, Jaghati Khan (when released) and Shiban, Khan of the Brotherhood of the Storm (if FW ever decided to sculpt him). I’m not planning to build a 30k army collection due to the current uncertainty of FW’s HH series and the prices (its even more expensive than GW). I hope you guys have enjoyed these two posts on Sevatar, and if you would like me to do more HH model posts or FW related items, comment below and I might do a post in the future. After five days (18th April) of getting this model cleaned, glued, primed and painted, I was finally able to finish it with arguably one of my best painted models to date. Originally I was planning on taking my time painting this model, but I got too invested in painting it with a lot of enthusiasm. Recently, I’ve purchased my first Forge World kit from Warhammer World from the HH section. There were a few characters to choose from but unfortunately my budget was limited, so I had to choose between Alexis Pollux or Sevatar. I went for Sevatar as I’ve read more about him than Alexis in the fiction of HH, I liked his story in ‘The Prince of Crows’ (by Aaron Dembski Bowden). The kit itself is a gorgeously detailed mini diorama featuring the convict himself, Sevatar and a fallen marine in a bloody mess (I’ll mention which legion I’ve painted for this poor fellow later on). Whilst plastic kits by GW are fantastic with details and textures by today’s standards, FW kits on the other hand really show their crispy details and exquisite sculpting. Like all resin models, before assembling and glueing is done, I had to check if all of the parts were in the box as well as the condition of the pieces. Luckily for my kit there were no moulding problems and major warping issues (apart from the dagger and staff). Again, I’d recommend watching Leakycheese’s video on how to prepare your resin kit to know what to do if a problem arises from the parts. Cleaning the model was done using an old tooth brush (clean it first for hygiene sake) and a tub of warm water with washing up liquid. Since the model may have some greasy surfaces on the parts (the shiny surfaces that feels greasy), it’s best to remove with warm water and scrubbed with a tooth brush. This is important when it comes to priming your model, it will not apply well on said greasy surfaces. For a best outcome, leave the model parts in warm water over night, or for a day if it’s bigger parts. Once left over time and taken out to dry for about an hour or so, the model should be ready for priming. The colour scheme I’ve used for Sevatar and the base were done by painting Sevatar first, then the base and the diorama base. This way, I wouldn’t have to worry about making any mistakes as I’m working from top down, rather than base to top. Painting Sevatar was done using the Night Lords Legion colour scheme in ‘How to paint Citadel miniatures: Burning of Prospero’, with some minor changes and additional colours. I used it as my main guide to painting a Night Lords Legion colour scheme, along with some visual inspiration which I’ve referenced in my mind. Most of these visual imagery are from Neil Roberts artwork in the HH series, and FW own painted model of Sevatar. Basecoat the model in Matt black primer, followed by two thin coats of Kantor Blue. Shade the recesses with Nul Oil. Highlight the edges and lightning cracks with Ailotic Blue. Finish off the armour with an edge highlight of Lothren Blue for the edge points and cracks for the lightning effect. Then a final touch up of Model colour Off-White for the thunder cracks. Paint Model colour Off-White on the the eyes lenses, two or three coats may need to be applied for consistency. Use Lahima Matt mixed with 1/3 Model colour Off-White and Model colour Plastic green. The paint should be translucent like water, and apply it with a small brush on the white eye lenses. Shade the bronze with Reikland Fleshade. Edge highlight the trims with Model colour Brass. Basecoat the wings in Khorne Red. Highlight the wings with Evil Sunz Red. Final edge highlight of Ryza rust. Basecoat the the skulls in Model colour Off-White. Shade the skulls in Reikland Fleshade. Final highlight of Model colour Off-White. Basecoat the cloak in Model colour Flat Brown. Shade the cloak in Reikland Fleshade. Mix 1/3 Model colour Off-White and Flat Brown as a highlight. Finally, add more Model colour Off-White to the mix as a edge highlight. Basecoat the blades and silver areas in Model colour Boltgun metal. Shade the areas in Nul Oil. I like the dark blue armour as it’s very simple to achieve without any complex colour scheme. The contrast of colours benefits the model appearance without it looking too dull and confusing. My goal was to stay true to the source material of visual depictions of Sevatar, but also try to improve my painting skills to a finer quality. I’ve just about achieved it, but a I think I could’ve improved on painting the chain glaive as it lacks much colour variety to make it look appealing visually (but Blood for the Blood God at least makes it look interesting). I think I’ll finish this post off here, as I don’t like to drag the post on too long. However, I hope you guys have enjoyed this post and found something new today! Any suggestions and feed back is much appreciated. Oh and before I finish this post, something for the Dark Angels to look at 😏………..
My name is Malhett, and I’m the last of the original son’s of Prospero. The day when Prospero had fallen was the day my legion died by the wolves of Fenris. They mercilessly slaughtered my brothers with their incessant pride like a pack of hungry wolves, ready to tear our throats with savage satisfaction. Me and my brothers couldn’t hold the ‘Space Wolves’ at bay, so we we fled to the safest way we could. Our options were limited, we would never be able to reach our primarch in time as back up, nor would we be alive if we stayed on our dying world. Our only option was to flee on our arcane craft away from Prospero. At first we left our planets orbit with ease, but then the wolves followed us with their weapons armed and loaded. Our craft was hit as we we’re about to jump into warp space, making our ships course go off its projected path way by the navigators. Thankfully we were able to exit the warp, and came out into the solar system to holy Terra itself. We might just be able to warn the Emporer of Horus’s betrayal and our Primarchs innocence in time. My memory after warp transition was hazy, I can only remember being knocked out after our ship was surrounded. The onboard incomes were humans of Terra, but bear iconography that I’ve never seen before. My last memory of the event before I became unconscious was seeing that symbol, an single ‘I’ in red with a skull in the middel of the icon. My brothers and I were interrogated for what felt like an eternity from our captors interrogation attempts. All of my brothers onboard the ship had died from interrogation, except for me, the last son of Prospero. 8,000 years later, I was proven to be loyal to the Imperium and the Emporer. However, the sins of my legion are hung upon my shoulders and must pay the price for its heresy. I was assigned to join an inquisition warband named ‘the Silence of the Shroud’, lead by Inquisitor Heralock. My role is simply to fight until I fall on my last breath, to atone for my legions heresy. However, if I do not die in battle, a worse fate will befall me by the ‘change’……. Bearing the legion symbols of a forgotten age, Malhett is a rusting relic that will never be remembered once he finally falls. Either by a killing blow from battle against the Imperiums enemies, or be consumed by the ‘change’ and become a warp tainted monstrosity. I hope you have enjoyed this post. If you have any questions, post a comment below and I’ll reply back as soon as I can. Thanks!